In part 1 of this three part series, I suggested that Blizzard could move more money through its auction house economy if it sorted prices from high to low by default, thanks to the anchoring effect. All of those items still had to be found from drops, though1, and that involves a lot of tedious grinding. And even though, sometimes it feels like rare drops are just too rare and will never happen. What can Blizzard do to keep us grinding? There’s a setting in Diablo III that lets you see when someone on your friends list pops achievements. For example, when your buddy beats Diablo2 for the first time on Hell difficulty and earns the associated achievement, you get a little notification near the chat area, along with an icon. It’s a neat social system that I think could be expanded to make people keep grinding for super awesome Rare or Legendary item drops. To illustrate why, consider a simple, 1973 experiment by Amos Tversky and Daniel Kahneman3 where they created a tape recording of 39 names. Nineteen of these names belonged to famous people, and the remaining 20 did not. When asked, 66% of the subjects were able to recall more famous names than non-famous, and the vast majority –80%– incorrectly claimed that there were more famous names on the list than non-famous. The reason for that last result, the researchers argued, has to do with what’s called the availability heuristic. In short, it refers to the fact that to the degree that recalling instances of an event or class of things from memory is easy, we will judge them to be more frequent or more numerous. In his book, Thinking, Fast and Slow4 Daniel Kahneman digs even deeper into the phenomenon, arguing that it’s an example of how part of our mind (the eponymous “Fast” part) will slyly substitute an easier question (How easy is it to recall an example of this phenomenon?) for a more difficult one (How frequent is this phenomenon?). Killed Maghda on Inferno? Happens all the time. There are many factors that make an event or thing easier to remember. For example, it may have happened in a very dramatic manner, it may have just happened recently, it may have affected you personally. The availability heuristic is the reason people thought school shootings were more common right after the 1999 massacre in Columbine, Colorado. It’s the reason most people overestimate the divorce rate in highly visible Hollywood couples. It’s why you think the Xbox 360 “red ring of death” failure is more frequent after it happens to you. 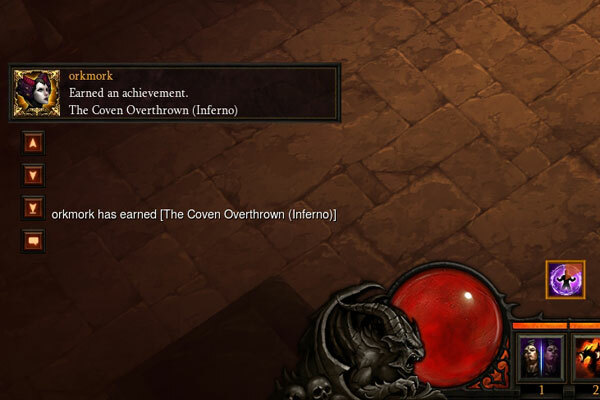 This is why I think that the achievement notification in Diablo III is a good start. It makes the number of people getting the achievement seem larger because it happened recently and to someone you know. The same effect could be used to make players think that the upper tier of “Legendary” item drops are more frequent if they saw a notification every time it happened to a friend. This would motivate players to keep playing in the (perhaps inflated) hopes of getting a similar drop. Blizzard could also post similar notifications about crafting high-end gems or blacksmith items. Or cracking the 10,000 dps threshold for the first time. Seeing notification of these events will make them seem more frequent and thus more likely to happen to you if you just keep at it. Done? You can go back to go back to Part 1 about anchoring in the auction house, or skip ahead to a discussion of what effects the auction houses have on dopamine rushes and loot hunting in part 3. Finally, there’s a bonus part 4 about the effect of item history on auction house prices. 1. Well, minus the ones that are crafted, but shut up shut up shut up! 3. Tversky, A. and Kahneman, D. (1973). Availability: A heuristic for judging frequency and probability. Cognitive Psychology 5, 207-232. 4. Kahneman, D. (2011). Thinking, Fast and Slow New York: New York. If the end goal is to move more money through the auction house, wouldn’t artificially increasing the perceived availability of rare items consequently reduce their price in the auction? If player’s are made to feel that they are within reach of obtaining their super rare weapon of their dreams, they are going to be less likely to pay for it through an auction. I do feel that notifying player’s of their peer’s in-game achievements is important to engaging a player though; especially if it is their friend’s achievements. A good example of this is in Team Fortress 2 when you are notified that a player on the server gets a loot drop, or kills you with one for that matter. i believe achievements happen too often and i turn off their notifications in wow and diablo now. it’s an overuse of metadata that just gets in the way. so many achievements were popping up in the first few weeks that it became absolutely annoying. they did a better job by making them account bound, but they went over the top. i.e. “get two barbarians to level 60” really? ludicrous. the point values don’t even make sense vs. the effort and ultimately – THERE IS NO REWARD. i think there are too many achievements and not enough of the ones that should matter, and a lack of incentive. some of the things you mentioned are good ideas, but people need a skinner box to enjoy it. as it stands the crap flashing on my screen just frustrates me.